I would like you all to meet Benny! He is 36 years young and his former owner passed away over a year ago from cancer after fighting the fight for over three years. I believe that Benny was very loved by her and well taken care of, but after she passed, she was taken in by family members who, let's just say, had NO idea how to care for a animal much less a parrot. Thank goodness that one of the family members had enough sense to realize this and got in contact with John Lege AKA "That Guy With The Birds" in and around October of 2011. John explained to them that he would gladly take the bird, but apparently ONE of the family members thought that Benny could fetch a pretty penny and wanted to sell him. 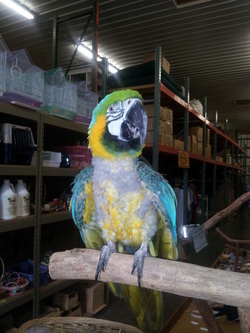 John explained that he does not buy birds and the owners were not heard from again....UNTIL....Saturday July 7th! 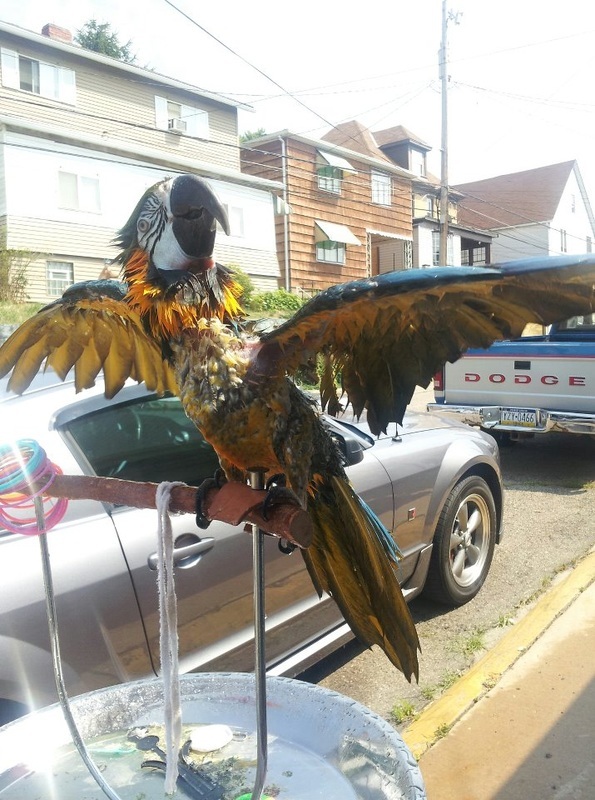 John and I were at the Greensburg Heritage Festival educating people about parrots and putting on little shows for everyone when he received a call from the sister of the owner that had passed away. She said she felt bad for the bird and knew he needed a good home and they were willing to let him go now. John told me about the story and after talking it over with my wife Sue, we thought that one more feathered friend in the house would be a good idea! John graciously went to their home to pick Benny up for us and then met me at C&B Birds for me to bring him home. John explained to me that the man of the house was not very well liked by Benny and when he was around, it was an all out fight with Benny lunging at the cage and hissing like mad! The man asked John "So....what do ya think that there bird is worth!" John told him (I'm sure in the most polite way) "HE is WORTH SAVING!" I think that pretty much sums it up in a nutshell? Speaking of shells, that is all this poor guy has eaten for the last year! Jumbo sunflower seeds! and that's IT for the last couple of years. Completely malnourished to the point his keel (Or breast bone) is sticking out like a sore thumb! Anyway...John kindly asks the man of the house to step in to the other room for a while and John let Benny settle back down. After a bit, John opened up the cage door, and Benny stepped right up on to his arm using every ounce of energy that the poor little guy had left. He nuzzled against John as if to say, Please get me out of here.....and that's exactly what he did! When John arrived at C&B birds, he came in and explained to me that Benny is in pretty bad shape and is going to need a lot of TLC and PROPER food to get him back on his feet again. When I first laid eyes on Benny, you could just see that he is a real sweetheart! Without hesitation he stepped on to my arm doing a little balancing act trying to hold his composure as a proud Blue & Gold Macaw should, but I could just tell that this guy really needs a lot of love and attention that he so deserves! It's going to take some time, but we hope to get him back in good health and feathers soon! I'm going to keep this article up to date as to his progress so check back often to see how our new buddy Benny is doing! I want to give a HUGE thanks to John Lege for allowing us to have the honor of giving Benny a good home! Also be sure to check out John's website by clicking here where he has a lot of stories about birds he has rescued over the years! Thank you John for all you do!! And Proud Dad of Benny! Benny gets his first shower in maybe 30 years! Benny had a good first night home with us! I'm sure he is stressed with the new environment AND all the attention! Today we gave him a good gentle misting outside! Unsure at first, he wasn't to keen on the idea of the garden hose coming at him, but once he figured it all out he sure did put on a show! The taking in of food right now for him is kind of a trial and error. Once we figure out just what he likes, other than sunflower seeds, we should be well on our way! As difficult as this is to write.....I wanted to share with everyone....we lost Benny last night. He had been doing fairly well the last few days trying new foods, fresh fruits and veggies as well as some new seeds and he seemed to be enjoying them although very slow to eat. We chalked it up to the new environment and the changes that have been made in his life over the last few days. We had him out on a stand in the garage waiting the arrival of friends who were coming in from out of town, and he seemed "OK". Once they arrived, we took him back inside to the kitchen where he had been staying on a large stand next to his cage. Sue was having trouble getting him to perch and when I came in, his keel was leaning on the perch itself. We stood there and watched him for a good while then decided to take him outside on the deck and just hold him. We sort of knew what was coming although we didn't want to admit it. We sat outside with him for several hours as he just became weaker and weaker, his wings spread out as if he was giving a hug as we stroked his head and beak. Our tears fell like rain on him as we knew the end was near. Sue and I never have had an experience like that before and to be honest it was the hardest thing to do. At 12:15AM he took his last breath and went to the big play stand in the sky. Even though he was only with us for a few short days, we know that his last moments in life were filled with love and joy. It amazes me how much Benny affected our lives in the short time. His memory will be with us forever and Sue and I hope that anyone reading this story that may have a parrot, will get up and go spend quality time with it because you just never know how much time you have. R.I.P Our dear sweet Benny boy.